Research shows this eating pattern can help prevent and manage this disease and its associated comorbidities. 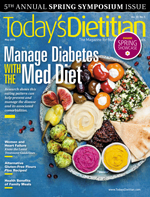 This article will discuss the Med diet's potential for preventing and managing diabetes-associated comorbidities and provide strategies for nutrition professionals who counsel clients following the Med diet. Uncontrolled hypertension is a risk factor for myocardial infarction, retinopathy, and nephropathy. Only 33% of people with type 2 diabetes and hypertension have their hypertension under control. Controlling glucose and lipids also are important components of diabetes management. However, lowering blood pressure has the greatest and most immediate impact on morbidity and mortality in people with diabetes.5 Studies show the Med diet is beneficial for reducing blood pressure. In addition to improving and decreasing risk of diabetes comorbidities, Mediterranean cuisine also shows value in reducing risk of developing diabetes and preventing long-term complications such as retinopathy. "The traditional foods (vegetables, fruits, whole grains, nuts, and seeds) that make up the bulk of the Med diet are fiber-rich and promote both a healthy weight and stable blood sugar levels. In fact, one review in the journal Metabolism, which looked at nearly 137,000 adults, concluded that sticking closely to a Med diet can slash type 2 risk by an incredible 23%," says Jennifer McDaniel, MS, RDN, owner of McDaniel Nutrition Therapy in St. Louis, author of Prevention Mediterranean Table: 100 Vibrant Recipes to Savor and Share for Lifelong Health, and a national spokesperson for the Academy of Nutrition and Dietetics. Olive oil and wine also are associated with decreased diabetes risk. The Mediterranean-style eating pattern is one of three USDA food patterns recommended in the 2015–2020 Dietary Guidelines for Americans. To help consumers put the Med diet into practice, Oldways, with the help of Harvard School of Public Health, developed the Mediterranean Diet Pyramid. In the Mediterranean Diet Pyramid, vegetables, legumes, whole grains, nuts, seeds, olive oil, fruit, herbs, and spices are the foundation of every meal. The pyramid also emphasizes physical activity and the act of enjoying meals with others. Seafood and traditional cheeses and yogurts are frequently used but in small portions. Sweets are reserved for special occasions, such as weddings or religious celebrations, while water and wine (moderate intake) are the beverages of choice. In addition to the Mediterranean Diet Pyramid, Oldways has several other resources such as a Med diet grocery list, four-week Med Diet Menu Plan Book, and a Med diet food glossary. • Dinner formula. One serving of fish plus one serving of whole grains plus two servings of nonstarchy vegetables. For example, salmon with an herby bulgur salad and a large helping of olive oil roasted broccoli, or sea bass served atop a small scoop of farro risotto and an olive oil massaged kale salad with shaved Parmigiano-Reggiano. • Snack formula. One serving of fresh fruit plus one serving of artisan cheese or nuts. For example, a fresh pear served alongside 1 oz of Parmigiano-Reggiano or walnuts, or a few fresh figs served with 1 oz of sheep's milk feta cheese or pistachios. "With the fat and protein from the nuts and/or cheese, and the fiber in the fruit, the fruit doesn't spike the blood sugar as rapidly, which is especially important for people with diabetes," Toups says. McDaniel says incorporating the Med diet into one's life is easier than most people think. Focusing on the "5 Steps to Eating Mediterranean Style" will move your clients closer to eating more like the people from the Mediterranean region. To increase adherence to the Med diet, dietitians must focus on patient education, which is one of their biggest roles, and clear up any misconceptions on what the diet does and doesn't entail, according to Toups. "Many patients have a disconnect between the Westernized, affluent version of Mediterranean cuisine, and a true, scientifically backed Mediterranean diet," Toups says. "The Mediterranean diet is not about endless breadsticks and deep-fried calamari. Rather, the Mediterranean diet emphasizes wholesome, minimally processed foods, inspired by a culinary tradition from a simpler time. RDs should help clients grasp what a true Mediterranean diet is and arm them with simple recipes as well as restaurant ordering strategies." McDaniel says RDs also should remind clients and patients that the health benefits of the Med diet aren't restricted to diet alone but also involve the Mediterranean lifestyle, "which encourages movement throughout the day, having a supportive community, and slowing down the pace of life." Moreover, she says it's important to "encourage your clients by recognizing the healthy Med habits they already possess—maybe they eat fruit for dessert or use olive oil to cook with or in their salad dressings." There's no standard meal plan that works for everyone with diabetes. However, the Med diet is an evidence-based eating pattern that should be considered for the prevention and management of type 2 diabetes and its associated comorbidities. Nutrition professionals are encouraged to provide individuals who wish to follow a Med diet the practical tools for implementation and behavior change that can be maintained for a lifetime. — Constance Brown-Riggs, MSEd, RD, CDE, CDN, is a national speaker and author of the Diabetes Guide to Enjoying Foods of the World, a convenient guide to help people with diabetes enjoy all the flavors of the world while still following a healthful meal plan. 1. Schaffer R. Prevalence of comorbidities high in type 2 diabetes. Healio website. www.healio.com/endocrinology/diabetes/news/in-the-journals/%7Be8d2355d-0624-4b22-9870-5047a797b526%7D/prevalence-of-comorbidities-high-in-type-2-diabetes. Published April 25, 2016. Accessed March 21, 2018. 2. Mediterranean diet. US News and World Report website. https://health.usnews.com/best-diet/mediterranean-diet. Accessed March 21, 2018. 4. American Diabetes Association. American Diabetes Association Standards of Medical Care in Diabetes — 2018. Diabetes Care. 2018;41(Suppl 1):S1-S159. 5. Management of common comorbidities of diabetes. American Association of Clinical Endocrinologists, AACE Diabetes Resource Center website. http://outpatient.aace.com/type-2-diabetes/management-of-common-comorbidities-of-diabetes. Accessed March 21, 2018. 6. Davis CR, Hodgson JM, Woodman R, Bryan J, Wilson C, Murphy KJ. A Mediterranean diet lowers blood pressure and improves endothelial function: results from the MedLey randomized intervention trial. Am J Clin Nutr. 2017;105(6):1305-1313. 7. Li S, Zhu Y, Chavarro JE, et al. Healthful dietary patterns and the risk of hypertension among women with a history of gestational diabetes mellitus: a prospective cohort study. Hypertension. 2016;67(6):1157-1165. 8. Huo R, Du T, Xu Y, et al. Effects of Mediterranean-style diet on glycemic control, weight loss, and cardiovascular risk factors among type 2 diabetes individuals: a meta-analysis. Eur J Clin Nutr. 2015;69(11):1200-1208. 9. Hernáez Á, Castañer O, Elosua R, et al. Mediterranean diet improves high-density lipoprotein function in high-cardiovascular-risk individuals: a randomized controlled trial. Circulation. 2017;135(7):633-643. 10. Centers for Disease Control and Prevention, National Center for Chronic Disease Prevention and Health Promotion, Division of Diabetes Translation. National Diabetes Statistics Report 2017. http://www.diabetes.org/assets/pdfs/basics/cdc-statistics-report-2017.pdf. Accessed March 21, 2018. 11. Mancini JG, Filion KB, Atallah R, Eisenberg MJ. Systematic review of the Mediterranean diet for long-term weight loss. Am J Med. 2016;129(4):407-415.e4. 12. Schwingshackl L, Lampousi AM, Portillo MP, Romaguera D, Hoffman G, Boeing H. Olive oil in the prevention and management of type 2 diabetes mellitus: a systematic review and meta-analysis of cohort studies and intervention trials. Nutr Diabetes. 2017;7(4):e262. 13. Huang J, Wang X, Zhang Y. Specific types of alcoholic beverage consumption and risk of type 2 diabetes: a systematic review and meta-analysis. J Diabetes Investig. 2017;8(1):56-68. 1. Let fruits and vegetables be your base. In the Mediterranean, produce tends to play a starring role, sitting at the center of the plate instead of on the side. Various vegetable dishes such as chopped tomatoes, bell pepper, and cucumber, or roasted carrots paired with warm hummus and whole-wheat pita make up a standard Lebanese lunch. 2. Go for whole grains. The Med diet is far from low carb, but the carbs are typically from whole grains. Encourage clients to get their rice cookers ready and enjoy more whole grains such as bulgur wheat, farro, and brown rice. 3. Flip your fats. Swap in more monounsaturated oils such as olive oil, nuts and seeds, and omega-3 fats from fish instead of saturated fats from meat and dairy. These monounsaturated fats help fight oxidative stress that can lead to inflammatory diseases such as type 2 diabetes. 4. Pick leaner proteins. People in the Mediterranean region rely on plenty of plant-based and/or leaner proteins such as beans and fish. Higher-fat meats are saved for special occasions or used more as a condiment compared with being the star of the dish. Enjoy beans several times per week. 5. Find fresh sources of flavor. The Med diet is intensely flavorful—thanks to the herbs and spices included in recipes. When clients add flavor through herbs and spices, they can rely on less salt in their diets. — Source: Prevention Mediterranean Table: 100 Vibrant Recipes to Savor and Share for Lifelong Health by the editors of Prevention and Jennifer McDaniel, MS, RDN.